As wonderful as a carefully crafted script is, some of the best movie moments are simply made up on the fly. CineFix returns with another great movie list – Top 10: Improvised Scenes in Movie History. Some directors hate improv and some barely require a formal script. I think erring on the side of having a Nolan-esque literary script in place is probably the prudent route, but as those are a handful a year, there’s something seriously admirable about an actor/director collaboration that just spontaneously generates magic on the spot. While improv is most associated with comedy, a good portion of the spots on the list go to famous dramatic scenes from Apocalypse Now, Goodfellas, A Clockwork Orange, and The Breakfast Club. Improv is a staple of comedy, and a lot of your favorite comedy moments, be they from Judd Apatow, Bill Murray, or Chris Guest, also make the list. Rather than picking a scene for #1 though, CineFix made the very wise choice of simply sticking Robin Williams’s name up top. If you’re going to have a list heralding lack of structure, Robin deserves to sit atop it with his whole body of work. Hard as it is to believe, this month marks three years since Robin Williams’ left us. Doing this blog, I write about a lot of celebrity deaths, but in the time that I’ve been doing it, and in my life really, the death of Robin Williams hit me like I’d lost a family member. Good times and bad, the man had a boundless joy running through him in such volume that you weren’t sure if it was going to actually make it to his mouth or go bursting out his ears. All that being said, his suicide didn’t surprise me, it just made me profoundly sad. People look at funny people like Robin and think how happy they must be, but humor doesn’t come from happiness; humor is the best bad way to cope with deep pain. The theory being that if you can’t escape your own demons and be happy yourself, maybe you can bring a smile to someone else’s face. I think Williams was happy when he was making others happy, but the need to be ON all the time and to do that must have been tremendously exhausting. I miss him, like I miss a friend gone on before, and this video from Goalcast which manages to take his graduation speech from Jack (NOT one of his better movies) and marry it to a beautiful montage of his career, is just beautiful. I think it’s the way he’d want to be remembered. Then if you find yourself tearing up after the first one, check out this interview with Craig Ferguson a few years before his death and you’ll remember the joy of just watching the man talk. We miss you Robin, and thank you. We continue to pick scenes from the late Robin Williams’ best works with 1989’s Dead Poets Society. This is, in my opinion, Williams’ best film. His unorthodox English-teaching methods exhort his students to seize the day and to love words. The right words, strung together can lift the spirit to unmatched heights. The wrong words, strung equally effectively can destroy a life. Words were Williams’ business and he relished concocting ways to use them in ways that had never before been used. He wasn’t a wordsmith. He was a word alchemist. Trying to pick one scene out of this film is nearly impossible, but-after thinking-I had to go with how the transformed students bid Mr. Keating farewell. It seems fitting given the circumstances. The Emmys have a long history of making me throw things even more than the Oscars do, so I normally do not watch them, but since this was Breaking Bad’s last year, I caught the show. Seth Meyers did a nice job hosting. Matthew McConaughey took no end of abuse for encroaching on television. The night’s highlight, though, which I’ve included above, was Billy Crystal’s moving tribute to his friend Robin Williams. 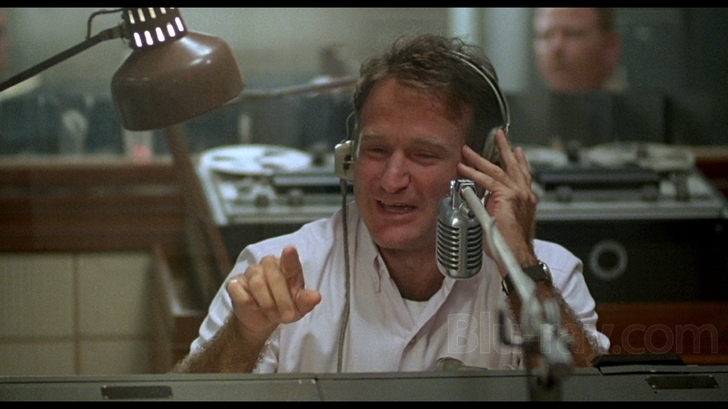 Good Morning Vietnam was the film that launched Robin Williams into the stratosphere, proving that his lightning-in-a-bottle humor could be effectively mixed into an affecting and moving motion picture. Director Barry Levinson got a signature performance out of Williams, who earned his first Oscar nomination for the role. It’s no surprise what my favorite scene is. It’s iconic: one of the signature scenes of Williams filmography: Adrian’s first broadcast to the troops (minus the musical intervals).